The Silex DS-600 is designed to easily connect and share USB 3.0 and 2.0 devices over a network. Printers, Scanners, Disk Drives, Cameras, Card Readers, or virtually any other USB device can be now be enabled with network capability. It allows flexibility to place the USB device anywhere on the network instead of needing to be attached directly to the computer, and multiple users can access the USB device. Data encryption (AES256bit) Data encryption is supported over network routes. It processes network transfer safely for data requiring high security. users, who can connect to a specifc USB device. Isochronous Transfer mode USB devices such as Webcams or USB speakers, which require consecutive and real-time data transmission, can also be used in a network environment. DS-600 supports both Full Speed and High Speed. Standard TCP/IP printing (LPR/RAW) DS-600 supports generally-used network printing protocols: "Raw mode printing" and "LPR printing". 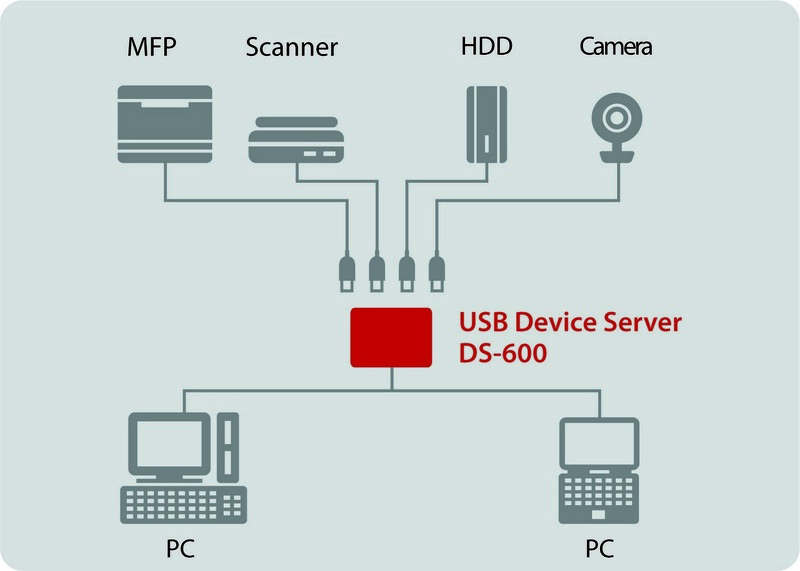 DS-600 can be available as a print server when it is connected to a printer. Simple configuration Silex free software "Device Server Setup" (available at Silex web site) gives easy-setup. Users just need to answer questions on the screen and the configuration will be easily done. ECO mode When DS-600 is not used for a certain period of time, the USB bus power feeding is turned off to save energy. It increases power-saving efficiency. The USB bus power feeding automatically restarts upon use. USB-Hubs DS-600 is compatible with USB-Hubs, allowing to increase the number of connectable USB devices. 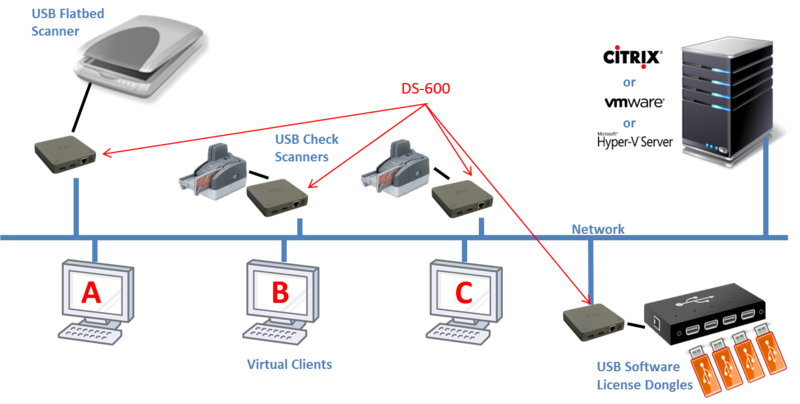 No special drivers or applications are needed to use the USB devices: Drivers and applications that worked when the USB device is directly connected to the computer will continue to work across the network connected to the DS-600. The included Silex SX-Virtual Link software precisely emulates a USB connection on a Windows or Macintosh computer, and then redirects the packets over the network to the USB port of the DS-600.